When I was younger I was a bit scared of seafood. I prefer it when food doesn’t look like the animal it came from and the claws/eyes/pincers/legs/tails do freak me out. I know that some people like it because they feel that they feel like it brings them closer to the animal and there’s a level of respect there – I understand, but I do not feel the same! Whilst looking for somewhere to go on our date night to celebrate Josh finding a new job, we settled on Loch Fyne at Bluewater Shopping Center. This was a massive treat for us and somewhere I’d wanted to try for ages! It can be a little on the pricey side but the food was amazing and it was totally worth every penny. I don’t know why but I’ve wanted to try Lobster for a long time. Like I mentioned before I’m a bit worried about the whole cracking the claws/ripping it apart thing and I guess I was worried that I wouldn’t like it after all the money and effort. So I haven’t tried it. Josh however has! He said that Lobster bisque (soup) would be a great way of letting me taste it without actually having to eat (and pay for) a whole lobster. This is the Lobster Bisque that Josh ordered as his starter (that his wifey kept dipping in to try!) and it was so good. 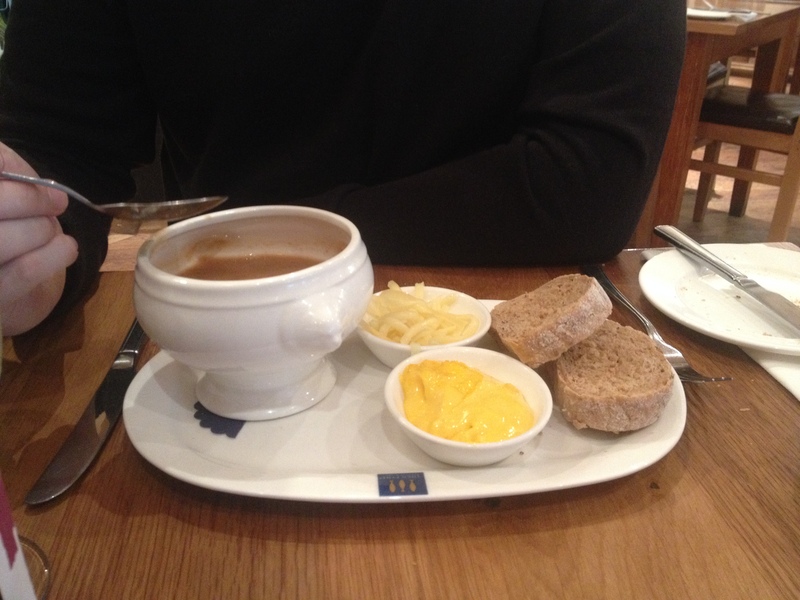 It was really nicely presented (served with grated cheese, aioli and granary bread) and tasted amazing. Josh was right this was the perfect introduction to Lobster as I got a good sense of it’s meaty-and-not-too-fishy flavour. 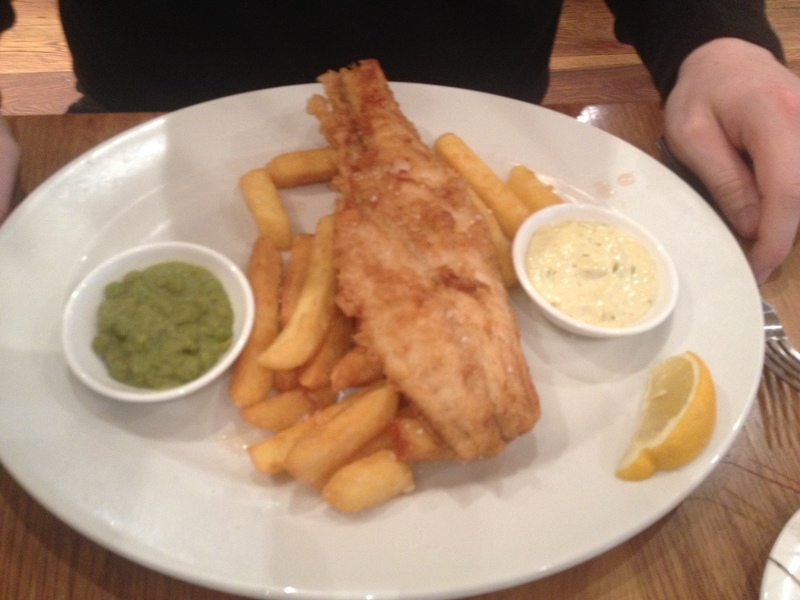 Josh is a fish and chip lover! He orders them so much when we are out – and although we are not sure anywhere can beat Fishes in Edinburgh where we went on our honeymoon (hands down best fish and chip I’ve ever tasted) – this was brilliant, the haddock was really fresh, the tempura batter was crisp and everything was really flavorful. Yes, I may have asked Josh to ‘sort them out for me’ but I did have a go (and made a right mess) out of one! 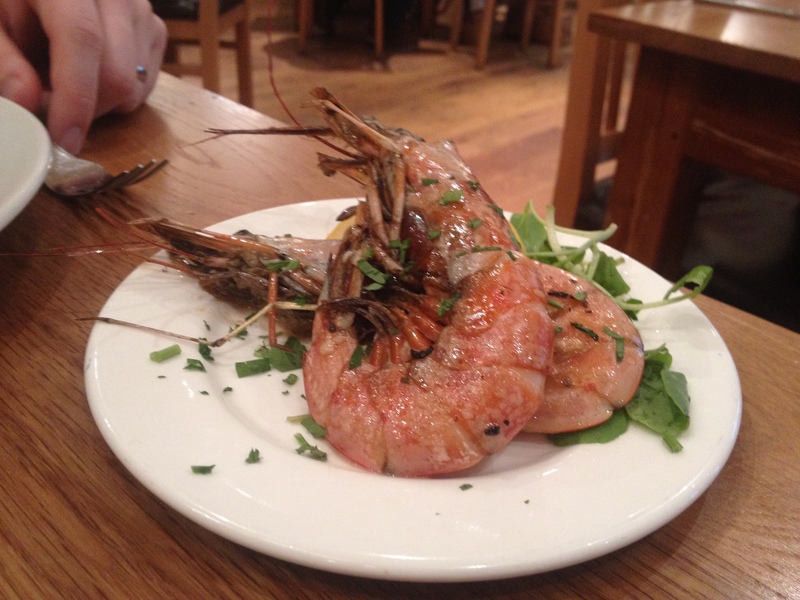 They were so good though, so juicy and delicious served in garlic butter – yum! This was one of the best meals I have had out in such a long time, the staff were so attentive and the food was amazing. I enjoyed every single bite! If you are like me and would like to try lobster but are also intimidated by the shell/claw situation.. the Lobster Thermador might be a better choice. The staff member that we spoke to explained that the lobster is already cut open for you, all the organs removed and the meat from the claws are put in the space where the organs were. It’s topped with a cheesy, creamy sauce too. It’s definitely one on my list of things to try (perhaps I can persuade someone to take me there for my birthday wink wink), the staff did say it wasn’t as good as a full lobster because some of the flavor got lost in the sauce but I think it would be perfect for a rookie like me! Is there something you’ve always wanted to try but haven’t had the courage to yet?